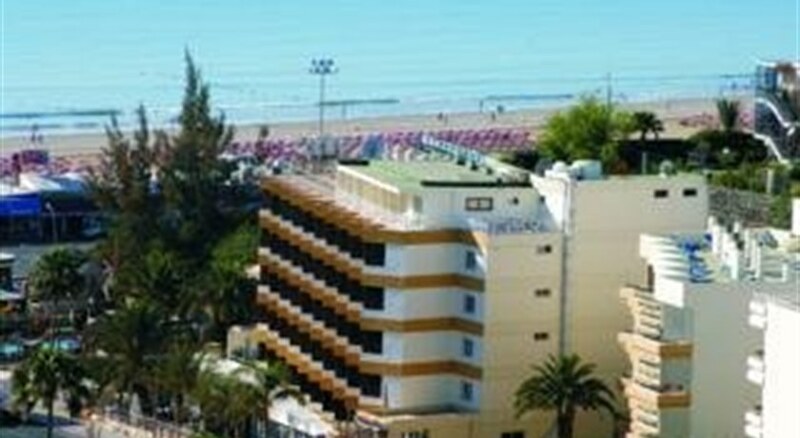 The Sahara Playa Hotel has a great beachside location on the southern tip of the Spanish island of Gran Canaria, in Playa del Inglés. This modern 3 star hotel offers an All Inclusive package and has 125 rooms and apartments available to singles, couples and families. With 2 outdoor pools and sun terraces, and direct beach access, complemented by a good buffet-style restaurant, the Sahara Playa Hotel offers a good value for money holiday to all the family. There are 3 commercial centres within a 10-minute walk offering a host of shops and bars to provide alternative fun to the more relaxed enjoyment of the Sahara playa Hotel. Getting to the hotel: Las Palmas Airport serves. Local tips: The hotel is set by the long sandy beach and esplanade; and the Kasbah and Metro centres are within 900m providing a range of entertainment. 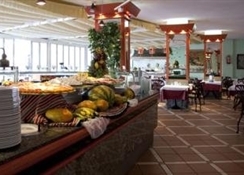 Food, drink and entertainment: Main restaurant offers buffet service for breakfast, lunch & dinner of varying cuisine ranging from local to Chinese, a bar service, and regular themed nights for entertainment. Sport, games and activities: 2 outdoor swimming pools, sun terraces with sunbeds, internet corner, pool table, and direct access to the 7km sandy beach with a range of external water sports/fun activities. For the kids: Under 2 yrs & 7 yrs have free cot/bed; reduced prices for older children. Additional: 24 hour Front Desk services, housekeeping, wired internet access throughout hotel (charge), there is no parking available, and no pets allowed. Max all inclusive is available with supplement. Max all inclusive includes Premium Brand drinks, branded wine during dinner, free safe, free beach towel, possibility to take lunch at Hotel Sahara Playa frontline on the beach, fruit and Cava in the room on arrival and once a week dinner in the Grill Restaurant Miraflor Suites. Guest rooms and apartments are clean and modern with a typically bright Mediterranean decor, comfortable furnishings of a contemporary style and contain amenities for your well-being; features include a furnished balcony or terrace (the majority with ocean views), a private bathroom includes a hair dryer, satellite TV, WiFi internet access (charge), telephone, mini fridge, safe box for rent, and 2 extra beds are available. 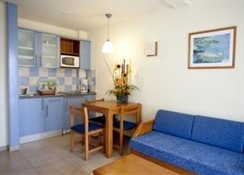 1-bedroom apartments have a furnished balcony or terrace, 2 beds, a lounge with sofa bed; private bathroom includes hair dryer, kitchen facilities, and safe box for rent.